Leslie Clay Bates- Age 81. He was diagnosed with Glioblastoma Multiforme (brain tumor) on August 8, 2018, comfortably passing at Alive Hospice, Nashville Midtown on November 23, 2018. He is preceded in death by his parents, John and Lillian Bates; brother, Johnny M. Bates; beloved cats, Miss Marshall and Hobo. Survived by his wife of 33 years, Judy Lee Bates; daughter, Jayme Roppel (Steven); grandson, Jaymes Roppel. He married Judy on Valentines Day on February 14, 1985. They happily resided at the beaches in Destin, FL (Paradise) and Franklin, TN. Leslie enjoyed spending time with his grandson and visiting with friends. He loved Five Guys Cheeseburgers, Coke Classics, Lays chips, dining at the Corner Pub and J. Alexanders restaurants. He enjoyed listening to music by Dolly Parton, Willie Nelson, Waylon Jennings, Elvis, and others. He enjoyed reading and watching sports and the news on television. He loved airplanes, helicopters and spent a lot of time at the radio control air field at Edwin Warner Park. His favorite flower was Hibiscus and he loved nature, flowers, birds, and hot air balloons. His cat, Miss Marshall lived for 23 years. He was a member of the Civil Air Patrol in his younger years (Air National Guard) and a member of Edwin Warner Model Aviators Club. 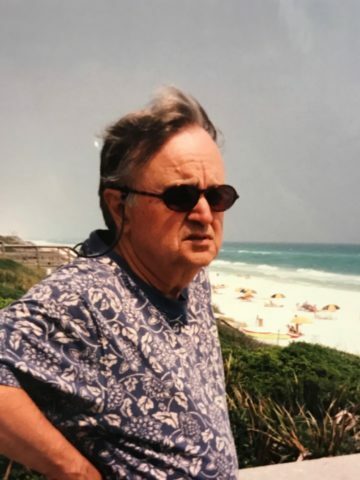 He was a lifetime employee of Regions Bank, formerly First American National Bank and AmSouth Bank. Visitation will be 11 a.m.- 1 p.m. on Wednesday, November 28, 2018 at Harpeth Hills Funeral Home with A Celebration of Life Service following at 1 p.m. Interment will follow at The Lakeview Estates at Harpeth Hills Memory Gardens. In lieu of flowers donations may be made in Les’s memory to Alive Hospice. Leslie and I were high school classmates.. We graduated from Gallatin High School in 1957. We were friends and I remember his fun loving personality and zest for life. My sincere condolences to Mrs. Bates and his family. Greater was the fact that we remained friends during retirement. A friend for 35 years, business, retirement, will be missed. Leslie Bates was a friendly, well-established fixture in the old First American Bond Department in the early 1980’s when I joined the bank. Highly respected by his colleagues for his remarkable balance of humor, integrity, candor and wit, Les served as an excellent role-model for newcomers and veterans alike. He will most certainly be missed. God’s blessings on Judy, Jayme and Jaymes. Les was an investment banker like no other. He was trustworthy, honest, witty, and truly loved his family. My prayers are with each of you during these difficult days. So sorry to hear of Les’s passing. I have known Leslie since childhood and will miss his personality and wit. He and Judy attended our high school reunions for the Class of 57 at Parsons High School in Parsons, TN for many years as his early school years were in Parsons. Our heartfelt sympathies go out to his family and friends. Judy, you are in our thoughts and prayers. One of my greatest losses of a friend in my life. We were close in school. This loss hurts, as I can imagine his family’s loss. Rest well old friend. Leslie was a childhood friend in Parsons. I always enjoyed visiting with him and Judy at our class reunions. He will be missed. My thoughts and prayers are with you, Judy and family.